The 3am Teacher: FREE Digital Neon Spatter Papers - I'M BACK!!! 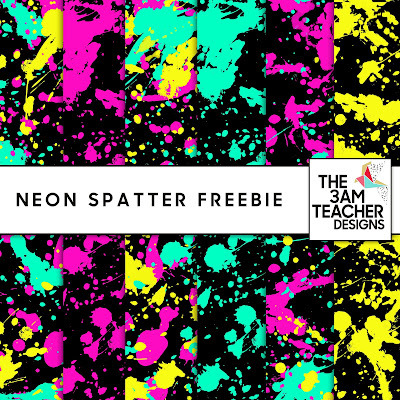 FREE Digital Neon Spatter Papers - I'M BACK!!! My summer has already been filled with fun family vacations, but I have been super eager to get back into creating! I have spent most of my time doing custom work for the last year, but I am not ready to start working on some of my own projects and getting some new clip art uploaded into my shops for all of you to enjoy! Thank you so much for all of your support and love over the years! This has been such an amazing journey - with so many ups and downs. Although I have not added new stuff to my shops for the last two years, I have been working on my health and spending more time with my family. Two areas of my life that seemed to get pushed aside when I was busy building my business. I have learned that BALANCE is everything and I don't always have to say yes (something that was really hard for me to learn). I would love for you to say hi and hear about how you have been doing! Make sure to drop a comment below <3 I hope to get reconnected with you all - I have so much to share about what's been going on in my life the last two years.